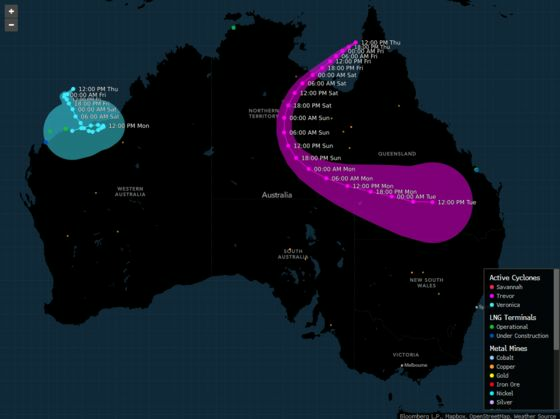 BHP stopped output at the Pyrenees oil project off Western Australia as cyclone Veronica tracked toward a hub of liquefied natural gas and iron-ore export operations. Ships left ports and workers fled the region ahead of destructive wind and heavy rain as the cyclone crossed the coast on Sunday. 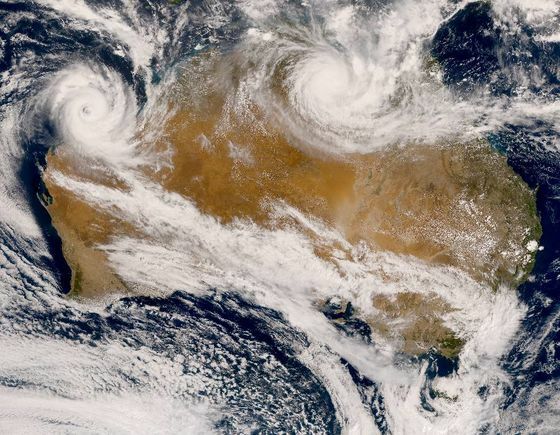 In the north, cyclone Trevor made landfall Saturday. Veronica’s core reached land midway between Karratha and Port Hedland Sunday morning as a category 3 system with wind gusts up to 220 kilometers (137 miles) an hour, according to the Bureau of Meteorology. Woodside Petroleum Ltd. and Chevron Corp. operate LNG export terminals in the region, while BHP, Rio Tinto Group and Fortescue Metals Group ship iron ore from a number of ports dotted across the Pilbara coast. Cape Lambert and Dampier have been cleared of vessels and port operations have stopped, Rio said in a statement, adding that non-essential workers have been sent home or flown out of the nearby town of Karratha. All large commercial ships have also been cleared from the harbors and anchorages at Port Hedland and Ashburton, Pilbara Ports Authority said. While Barrick Gold Corp. is not expecting the operations of its joint venture with Newmont Mining Corp. near Kalgoorlie to be affected, it’s “taking precautionary measures just in case,” according to an email from Barrick spokeswoman Kathy du Plessis. Australia’s north was also hit by tropical cyclone Trevor, which crossed the Northern Territory coast on Saturday morning as a category 4 storm with wind gusts of 250 kilometers (155 miles) per hour. The storm was downgraded to a tropical low on Sunday morning. South32 Ltd. halted its GEMCO manganese operation on Groote Eylandt, off the Northern Territory coast in the Gulf of Carpentaria, and sent workers out of the area, the Perth-based miner said. “Operations have ceased until the storm passes and the extent of any impact can be assessed,” the company said. Rio has commenced start-up procedures at its Weipa bauxite mine on the Queensland coast after operations were suspended earlier this week when cyclone Trevor passed over the Cape York Peninsula, the company said in a separate statement. On average, 10 to 13 tropical cyclones form off Australia each season. The last time two cyclones of category 4 strength or higher were in the region was in 2015, according to the bureau. An Australian category 5 cyclone, the most severe, is the equivalent of a category 4 to 5 hurricane in the U.S.